I had worked for about a month on the message. The church was Grace Evangelical Free Church in Jefferson City, MO. 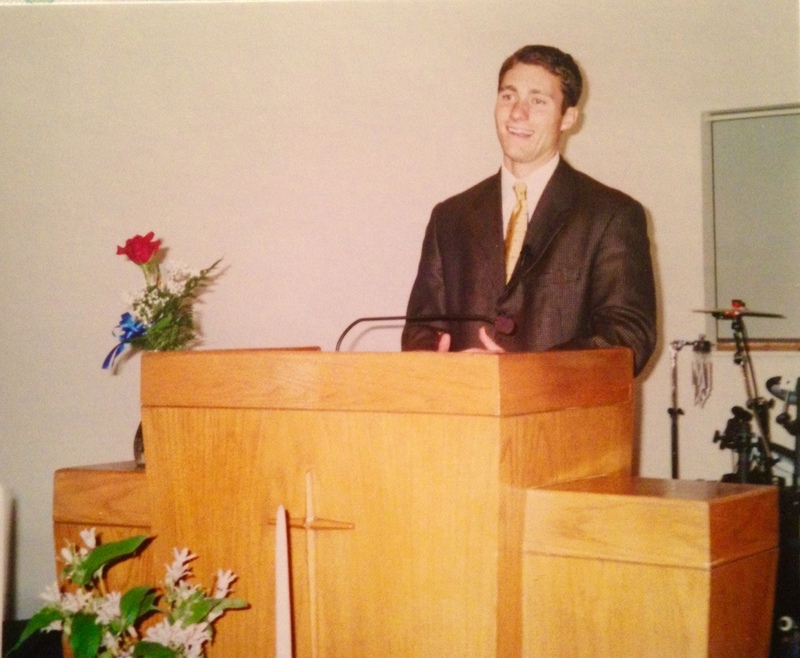 And at 10am, on Sunday, October 24, 2004, I preached my first sermon. The morning, however, was not without a few rookie mistakes. For example, early in the morning I set my stopwatch on the pulpit; I wanted to make sure I didn’t run long. That’s natural, right? However, I forgot to turn off the stopwatch alarm. During the scripture reading, which by someone else, (much to their confusion) the watch alarm started beeping. And continued to beep for 60 seconds. That hasn’t happened again; trust me. Anyway, the passage was Acts 9:20-31, and each year on my trek from Genesis to Revelation, when I pass though this section, I smile. I thought you might enjoy a few lines from the introduction. In this text, we see some of the early frustrations of Paul’s conversion and also some of the early fruit of his conversion. We see people following the Lord because of Paul, and we see people trying to kill Paul. It is in these early events after the conversion of Saul, the persecutor of Christ, that we see God’s faithfulness and sovereignty displayed. From the rest of scripture we know that Paul became the most prominent figure in the New Testament, except of course for Christ. Paul became the great letter writer (the next thirteen books of the New Testament are his letters). And he became the great theologian (cf., Romans). And in the book of Acts, and through his letters, he becomes the great missionary to the Gentiles, pioneering the gospel through all of the Roman Empire. However, all of this didn’t happen overnight. The quickness and suddenness of his conversion on the Damascus Road would not become the precedent for growth in Paul’s life. The weighty task of leadership was not imparted by God in a matter of moments, but rather through years of sovereign preparations and through trials and difficulties of such severity that, at one point, he told the Church in Corinth that there was a time when he even despaired of life itself (2 Corinthians 1:8-10). I preached those words ten years ago today, and now, I see the truth of the message with more clarity, not less. In God’s economy, nothing is wasted. He uses it all, shaping us to be what he wants us to be, and simultaneously fulfilling his mission in the world. Sometimes this change comes with the “quickness and suddenness” of the Damascus Road, but most of the time, it comes with the speed of a glacier... but also the power. I saw this in Acts 9:20-31, and I see it still.